► The Legal Citation Guide is spread out over 3 pages. ► This is page 1 of 3. There is also page 2 and page 3. For lawyers, legal assistants, paralegals, judges, clerks ... almost all legal research and advocacy relies very heavily on legal citation. Case citation serves two major functions: first, a complete legal citation allows the reader to find the decision; second, it should convey valuable information about the case, including the date it was handed down, court level, jurisdiction and case history (if included). Accurate citation provides a road map which directs the reader to where to locate the law. As with an actual road map, users of citations depend on their accuracy. Inaccurate or incomplete citations will result in people taking a detour from their goal and wasting time in their legal research. Under each of these headings, you will find an explanation and detailed breakdown of how to construct a citation, followed by a series of examples. It is important that you take the time to understand and follow these steps to correct citation. The citation is a valuable and concise source of information which includes the name of the parties involved in the action, the date the decision was handed down, the jurisdiction and the court in which the case was heard. It also provides information on where a specific case may be found--i.e., in what reporter(s) the case in its entirety is located. Lawyers use cases to make claims about the strength of their own cases and about the law itself, and other legal professionals--judges, clerks, opposing counsel--are required to determine whether those claims are accurate by finding and reading those cases. As a result, legal professionals are expected to know how to cite cases correctly - the inability to do so can damage one's credibility. The names of the parties and the "v" are italicized. If you are ever in doubt as to what the style of cause for a case should be, this is a useful bit of information. Check the first page of the judgment and if the case has an "indexed as" reference, use it for citation purposes. As an element of constitutional monarchy, Canadian executive government authority is formally vested in the Queen, hence the use of "R." for the Latin word for QRegina, in legal citations. This is used mainly for criminal cases prosecuted by the state, although you may also see R. as part of a citation for a civil case, in place of such terms as "The Queen", "The Queen in right of," etc. If the specific government department or agency that is involved in the civil litigation is known, use it rather than "R."
Other jurisdictions may use PP for Public Prosecutor or State of X as in State of Montana v Duhaime. Since 1999, many courts around have begun assigning neutral citations to their judgments (also known as public domain citations). If your decision has a neutral citation, you must cite to it first, and then to a printed reporter. Both are required if both are available, as the neutral citation is only a case identifier and does always means that the case is available on the Internet. Because the neutral citation indicates the year of the decision, the court, and court level, these elements should be omitted from the rest of the citation. The year in which the case is decided (and/or published) follows the style of cause and must be in brackets. The brackets will either be round for year of decision or square for reporter volume designation. R. v. Carosella (1995), 26 O.R. (3d) 209 (C.A.). Hopp v. Lepp,  2 S.C.R. 192. Note that the comma follows directly after the style of cause. When there is a neutral citation, no date is needed after the style of cause because the neutral citation includes the date (see example 1). However, the reporter series may still require a date in square brackets, as in the second example. Clearbrook Iron Works Ltd. v. Letourneau, 2006 FCA 42, 46 C.P.R. (4th) 241. R. v. Kang-Brown, 2008 SCC 18,  1 S.C.R. 456. (Round brackets) refer to the date the reasons for judgment were handed down. [Square brackets] refer to the date on the spine of the reporter - the date of publication. The round brackets clarify that the decision was handed down in 1987. The square brackets refer to the law report volume in which the case appears. Generally, the use of brackets changes from jurisdictions to jurisdiction. The English are particularly fond of square brackets even when they add nothing such as  AC 123. Even some Canadian publishers such as Quicklaw, defer to this format as in  BCJ 123. Other jurisdictions, especially the Australians and New Zealand, but also the United States, do not present or are increasingly abandoning redundant punctuation. What used to be 123 F. (3d) 123 is now 123 F3 123. All of this is driven by the Internet and the exigencies of computer search: search engines strip away redundant punctuation so legal citations are under tremendous pressure to deliver computer-friendly legal citations. This is a welcome development as legal citations have been, historically, driven by commercial law report companies who have proposed legal citations as trademarks and not necessarily as user-friendly research tools. In most cases, the year of publication coincides with the year the decision was handed down. Sometimes, however, there is a time lag between when a case was decided and when it was reported. Be aware that it is possible for a 1987 case to appear in a 1988 court reporter. To be sure of the year of the decision, look at the first page of the case itself. This citation indicates that the case will be found in volume 107 of the fourth series of the Dominion Law Reports at page 457. The date is not integral to locating the case. 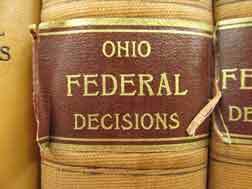 A law reporter is always referred to in the citation by a standard abbreviation of its title. There are a great many court reporters. It is not necessary to memorize the abbreviations for each; there are books and an online Legal Citations & Abbreviation section on this website which provides a list of reporter names and abbreviations used for citation purposes in Canada. The reporter series number is also abbreviated and placed in brackets directly following the report title. The abbreviations used are (2d), (3d), (4th), (5th) and so on. The series numbers should not be in superscript. 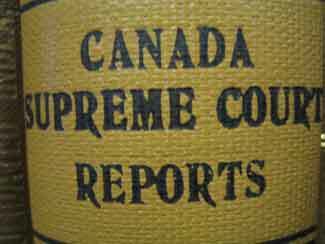 This case can be found in volume 85 of the fourth series of Dominion Law Reports. As a general rule, one must always be able to discern both the jurisdiction and court level from the citation. This information will either be implicit in the neutral citation, the title of the law reporter, or expressly indicated in round brackets at the end of the citation. Implicit in the reporter title is the information that this case was heard by the Supreme Court of Canada. As a result, it is not necessary to list the court in brackets at the end of the citation. The neutral citation indicates that the case was heard at the Federal Court of Appeal, so no court information at the end of the citation is needed. Duhaime.org and Lloyd Duhaime wish to acknowledge and thank the Lederman Law Library, Faculty of Law, Queen's University, Kingston, Ontario (Canada), for permission to use significant portions of their article Legal Citation to construct the above Legal Citation Guide, on this website, in all its several parts.